For several years now I have been working on a series of one of a kind pieces that are based on Victorian taxidermy armatures. I have collected books on the subject since I was a kid and have always been fascinated with the antiquated processes. 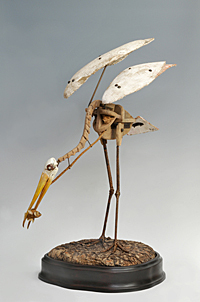 In those days they created elaborate armatures to hold up the skin and stuffing for big game mounts, they were amazing. Unfortunately, the finished product was usually lacking in the desired lifelike effect. 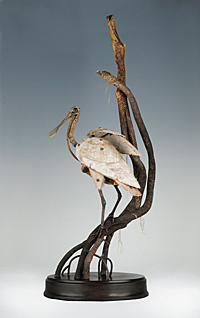 I am incorporating the use of period taxidermy materials, wood, plaster, copper, burlap, leather, bone, etc… to construct minimalistic sculptures. My goal is to create pieces that truly capture the subject utilizing the knowledge I have acquired through my various artistic endeavors. I enjoy all the different materials and processes required to complete a piece.